Methi rice recipe or methi pulao recipe – healthy rice dish made from fenugreek leaves and flavored with few basic spices. Fenugreek leaves has faint bitter taste. We like this methi flavors so I use the leaves as such. But if you don’t like the bitter flavor, you can reduce the bitterness of methi leaves. Take chopped leaves in a colander, sprinkle some salt and keep it aside for 10 minutes, Then squeeze out all the water, with this water bitter taste is also flushed. Now use squeezed leaves in the recipe. This is one of our family favorite rice dish recipe. Dear hubby wants this in his lunch box every week. I make this for him once a week whenever methi leaves are in season. I also keep some for myself for the lunch. Fresh methi is easily available in nearby Indian grocery store where I live. So I have used fresh methi leaves for making this rice. But when methi is not in season and fresh one is not available, I have made it using frozen fenugreek leaves also. If using frozen the defrost them and squeeze out the water before adding in the recipe. 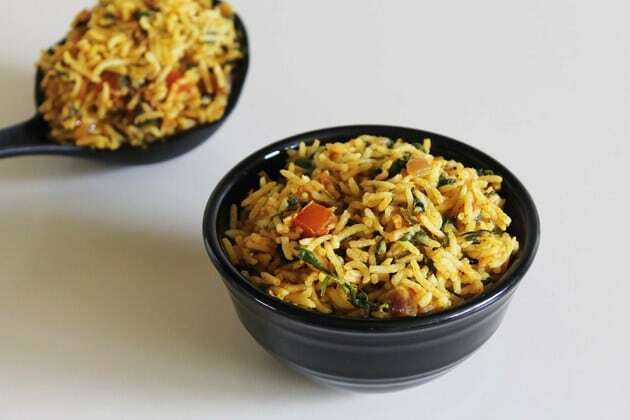 For making this methi pulao, few basic spices are added. Meaning this is slightly spicy pulao. Sometimes I do make mild methi pulao recipe similar to veg pulao. I will share that version soon. Please adjust the red chili powder and green chilies, if making for your kids. 1) First cook the rice, To get 3 cups of cooked rice, you will need ¾ to 1 cup of raw rice. Here I have shared how to cook basmati rice. Let the rice cool down slightly and then use in the recipe. Alternately you can use leftover rice. 2) Also pluk the methi leaves, measure to 3 cups. Then wash it very well and chop them. Also chop onion, tomato and green chili. 3) Heat the oil in a pan on medium heat. Once hot add cumin seeds. Let them sizzle. 4) Then add whole spices (bay leaf, cinnamon stick, cloves and cardamom). Saute for about 30 seconds and you will get nice aroma from the spices. 5) Then add ginger paste, garlic paste and chopped green chilies. Cook for 30-40 seconds or till the raw smell of ginger-garlic goes away. 6) Then add chopped onions. Add salt to speed up the cooking process. Be careful while adding salt, if your cooked rice has already salt in it. 7) Let the onion cook till it gets translucent and pink. 8) Then add chopped tomatoes. Also add spice powders (cumin powder, coriander powder, red chili powder and turmeric powder). 9) Mix it well and let it cook for 2-3 minutes or till tomatoes get soft slightly, but not mushy. 10) Then add chopped methi leaves and mix it well. Cook for 1-2 minutes. 12) Mix it very gently till everything is incorporated well. Make sure not to break the rice grains. 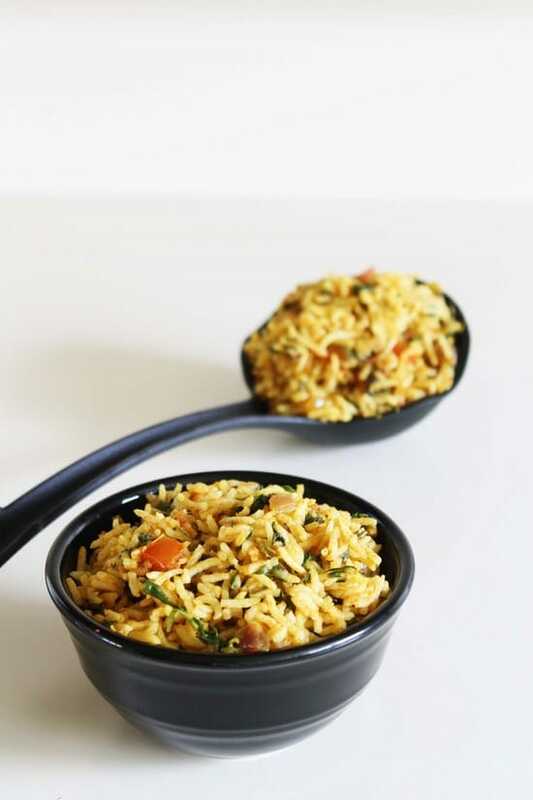 Methi rice or methi pulao is ready to serve. Serving suggestion: Serve with plain yogurt or any raita recipe. This rice is perfect for the lunchbox. Do pack some yogurt or raita or roasted papad in separate container. To get 3 cups of cooked rice, you will need ¾ to 1 cup of raw rice. Let the rice cool down slightly and then use in the recipe. Alternately you can use leftover rice. Also pluck the methi leaves, measure to 3 cups. Then wash it very well and chop them. Also chop onion, tomato and green chili. Heat the oil in a pan on medium heat. Once hot add cumin seeds. Let them sizzle. Then add whole spices. Saute for about 30 seconds. Then add ginger paste, garlic paste and chopped green chilies. Cook for 30-40 seconds. Then add chopped onions and salt. Let the onion cook till it gets translucent and soft. Then add chopped tomatoes. Also add spice powders. Mix it well and let it cook for 2-3 minutes or till tomatoes get soft slightly, but not mushy. Then add chopped methi leaves and mix it well. Cook for 1-2 minutes. Add cooked rice. Mix it very gently till everything is incorporated well. Cook for 2 minutes and turn off the stove. Tried the recipe minus the tomatoes. I have heard tomatoes and greens should not be mixed as it makes the food toxic. Turned out tasty. I am not aware of mixing tomatoes and greens. But anyways glad that recipe was helpful to you.